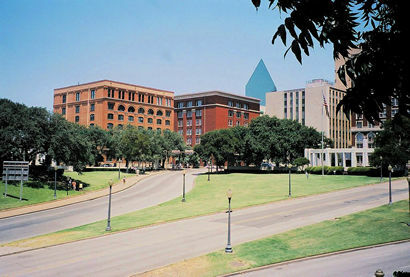 Dealey Plaza is located in Downtown Dallas where Main Street, Elm Street, and Commerce Street converge. Constructed in 1940, it was the result of a WPA project during the Great Depression. 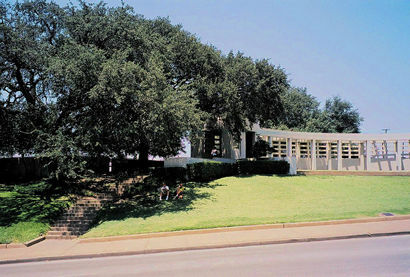 Famous for being the location where JFK was assassinated, the plaza was built to honor George Dealey. He was the publisher of the Dallas Morning News, involved with the paper in 1895 as the manager. He moved up the ladder until he became the president in 1919. He founded the radio station WFAA in 1922. In 1922, he bought the Dallas Morning News, the Farm News, and the Texas Almanac. He also owned the G. B. Dealey Land Co. and the West Commerce Realty Co.
Dealey used the Dallas Morning News to start a campaign that led to the formation of the Dallas Civic Improvement League in 1902. He also used his influence to get the Kessler Plan adopted in 1910. Its purpose was to improve Dallas and help the city to expand. He helped with making SMU a reality and played an important part in bringing a branch of the Federal Reserve to the city. Dealey served on the board of governors of the American City Planning Institute, became Vice-President of the National Municipal League, and helped with the Commission on Interracial Cooperation. He was a director of the Children�s Hospital of Texas and President of the Family Bureau. He was the founder and lifetime president of the Dallas Historical Society, a life member of the Texas State Historical Association, and a member of the Texas Press Association. He passed away in 1946.